Reprinted with permission from Stanley Ginsberg's and Norman Berg's Inside the Jewish Bakery: Recipes and Memories from the Golden Age of Jewish Baking. Combine the flours, salt and instant yeast into a mixing bowl or the bowl of a mixer, and use the flat (paddle) beater to blend at low (KA 2) speed, about 1 minute. In a separate bowl, whisk together the honey, water, eggs and oil, then add to the dry ingredients. Continue blending until the dough is evenly hydrated and comes together in a shaggy mass. Switch to the dough hook, if using a stand mixer, and knead at low (KA 2) speed for 10-12 minutes until the dough forms a smooth, glossy ball that leaves the sides of the bowl. If kneading by hand, turn the dough onto a well-floured work surface and knead for 12-14 minutes until the dough is smooth and elastic. Form the dough into a large ball, put it into an greased bowl, cover with a damp towel or cling wrap and allow to ferment until doubled in bulk, about 60 minutes. Turn the dough onto a lightly floured work surface and punch it down. Divide it into two pieces of approximately 24 ounces/680 grams and divide each of these into as many pieces as appropriate for the braid you’re using. Roll each piece into a tight ball, cover them with a damp towel and allow them to rest for 20-30 minutes to relax the gluten. Using your hands, roll each piece into a long sausage that is thick in the middle and tapered to a point at the ends and braid. Put the braided loaves on a piece of baking parchment, cover them with a damp towel and allow them to proof until your finger leaves a dent in the dough that doesn't spring back. About 20-30 minutes before bake time, preheat your oven to 350°F/175°C with the baking surface in the middle. Brush each loaf lightly with beaten egg, wait one minute and then give them a second coat. Sprinkle with poppy, sesame or chernushka seeds to taste. Slide the loaves and parchment onto your baking stone or bake on a sheet pan for 30-40 minutes, turning the loaves halfway through so they’ll brown evenly. Transfer the finished loaves to a rack and let cool for at least an hour before cutting. Inside the Jewish Bakery can be purchased on the Inside The Jewish Bakery website, on Amazon.com or Amazon.ca, or at your local bookseller. Thank your for posting this recipe, Floyd! It looks very nice challah! Can you do this by hand? To make a long story short, I burned the transmission out on my KA pro making bagles. :-( I would love to do this bread this weekend but is it possible to do with the french fold method and how would I change the process to account for the longer ferment times required by this method of kneeding. I made this recipe, by hand(over a year ago, during the authors' test baking trials). I don't recall it as being so tricky or sticky as needing to resort to "French folding", although that term may mean different things to different people. During the normal course of hand kneading though, I often do a few "slams and stretches" of the dough on the counter. If you think the dough is still not developed enough after 15 minutes or so of kneading, you can do a couple of additional "stretches and folds" at 20 min, and 40 min, during the bulk fermentation. So actually, the directions mention hand kneading if one desires to do it that way. I do usually withold about half a cup of the (white)flour called for to use during the hand kneading. 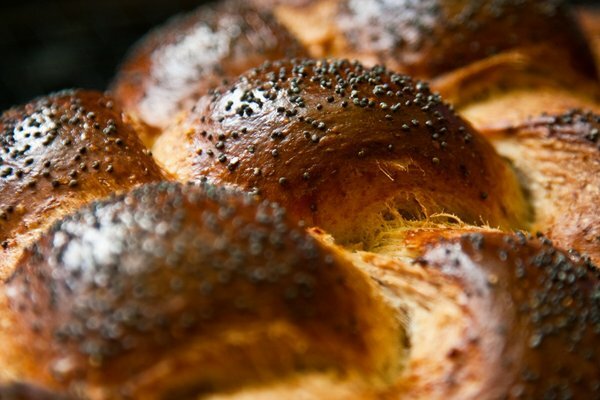 mrfrost- Please let us know what type of braiding that you did for your challah, and is the challah pictured made from the full recipe or just half of the dough as the recipe specifies? It is truly impressive!! I have been inspired, and I have been making challah for years. As stated, the version I made was from the test trials. It made only one loaf and called for virtually half of the ingredients listed above(looks like some very slight changes may have been made, not very significant though). The braid is a 4 strand method. In the trial recipe, pretty detailed instructions are given on how to do it. Being far from an expert Challah maker and/or braider, I was still able to get something done there. As usual though, I'm sure I looked at several Youtube videos that looked close to what was being called for. Thank you so much. I can't wait to try this, and then show some of my friends how to as well. I'm ready for my book to get here! That's gorgeous. At a pound and a half each, I would say that it would make a nice 6 strand challah (which looks really impressive and is pretty easy IMO). The 4 strand looks really nice though. I can't wait to hear reviews on this book. I like how the instructions are given very precisely and are easy to understand. Do all the recipes have oz, gr, and baker's percentage (as well as volume... lol at 1/2 an egg)? I hope so as that is so helpful. Well, had my first baking weekend of the season. I had planned on doing a tripple batch of Potato Rosemary Bread from BA and the honey whole wheat Challa from here. The Potato Rosemary bread came out great but the Challah, not so much. Right from the start it was very stiff. I am one of those people who follow the directions closley the first time to see what the result will be without making adjustments. In this case the dough never relaxed. It is supposed to bulk ferment for 60 minutes or untill doubled, in my case it took 3 hours to double. ( I bulk ferment in my proofing bucket with a lid. I set the dough outside on my patio where the temp yesterday was about 85 degrees) While dividing them into the balls they were so dry that they wouldnt even stick to themselves. It was more the consistancy of playdough than bread dough. Needless to say when I went to make the strands for the braid there was no elasticity. The strands would just tear once they got past about 8 inches in length. I am going to try it again this weekend but I am going to have an extra cup of water on hand during the mixing to make sure the hydration is high enough to actually get some streach in the bread this time. I agree. I had to add quite a bit of water to get a proper dough consistency. Result was excellent! Although my braids looked horrible, it tasted pretty good.